Ankita, an employee in an information technology firm, stays on rent and has to change houses from time to time. “Shifting is painful. I have to make many calls to find people who would move my things safely. It is not only tedious but pinches my pocket. I wish the logistics sector were more organised.” To fix this, Porter, an aggregator of light trucks, has come up with a solution. 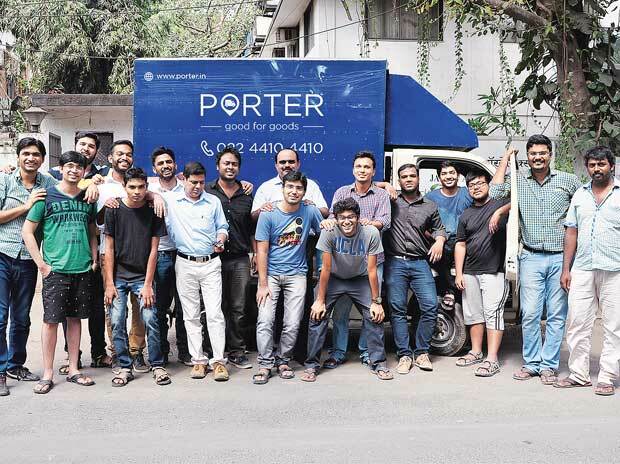 Founded in August 2014 by Pranav Goel and Uttam Digga from IIT-Kharagpur and Vikas Choudhary from IIT-Kanpur, Porter allows businesses and consumers to hire trucks for their intra-city pick-up and delivery needs. “Porter was inspired by inefficiencies in the logistics space. My family had a saw mill business where logistics was a significant cost. There, I observed several pain points in the areas of procurement and fulfilment for services. The desire to solve that through technology led to the idea of Porter,” says co-founder Goel. Customers can book a truck by making a phone call to its call centre, or through an app. A truck reaches the customer within 30 minutes and he could track movement of the cargo. Its clients range from local shops to small and medium enterprises to large institutions. It currently serves ITC, Amazon, FedEx, Urban Ladder, Delhivery, TinyOwl and many more. The firm raised Rs 35 crore in Series-A funding from Sequoia, Kae Capital and other investors. “Players across these three sectors were unorganised. In such a scenario, the cost of delivery becomes expensive because all the assets are underutilised,” said Abhishek Bansal, co-founder of Shadowfax. According to experts, the logistics market in India is estimated at $150 billion, of which $35 billion is in intra-city goods movement. Intra-city logistics is highly fragmented and, as a result, extremely inefficient.Small players have mushroomed across different cities. Moovo, Shippr and Blowhorn are some of the few start-ups in the segment. Goel believes Porter should be able to provide a significantly better customer experience at a competitive price. Regarding online cab booking start-ups that are trying to leverage on the on-demand logistics space, Goel says both are different markets. One is business to consumer and the other a business to business market. “I don’t think in the shortrun any of the cab service would be entering this segment. It is a different dynamic, different customer profiling, different vendor profiling,” added Goel. “Porter aggregates local truck owners on to a single platform. It is by far the largest aggregator of light trucks in India,” says Gautam Mago, managing director, Sequoia Capital India Advisors. Since it started, the firm has grown 50 per cent month-on-month. It is demonstrating strong week-on-week growth in revenue, clients and number of drivers. Considering the fragmented state of the market, the firm aims to break even in each city two years post launch. There is an algorithm engine for the back-end technology. Porter gets clients through customer care and its web page. Based on customers’ timing, and type of vehicle requirement, the nearest driver is allocated. This helps minimise idle time. The drivers are technologically trained and have to clear a test to go on field.The biggest challenge it has faced so far is low mobile technology penetration and awareness about technology on both the supply and demand side of the business. B2B customers also take more time to switch from existing providers. “Different demographics, the way logistics and the way route planning has to be defined, identifying customers and target audiences such that the cost is minimised would be a challenge. The key challenge is to adapt in a different city at a different moment of time,” said Bansal. With the help of technology and a mobile app for truckers, Porter aims to offer a standardised service and drive higher utilisation of trucks. This allows them to offer a cost-effective service, about 30 per cent lower than the market price to their customers. Porter has built a number of products for demand and supply aggregation. This results in an average trucker being able to do 2-4x the number of trips per day on its platform than they would otherwise. It charges a commission which is a percentage of the trip value. The commercial vehicle market in India has grown exponentially in the past couple of years. The current LCV (light commercial vehicle) market in India is pegged at about $8billion, with approximately two million trucks. According to recent reports by ICRA, the demand for LCVs would grow at a compound annual rate of 11-13 per cent in the long term. There is tremendous potential in the logistics sector. However, the trucking sector is highly unorganised. This triggered the need for a marketplace to bridge the gap. Porter, an on-demand logistics marketplace, realised this gap in last-mile delivery. However, the service provider is currently slow and requires a good marketing and branding strategy to generate awareness. Another aspect is competition. Though there are no major players with a significant footprint in this market, there are several start-ups mushrooming. Porter needs to address these concerns by intensifying its delivery model and fuel expansion plans. Overall, this is a very interesting and challenging segment to watch. The gaps in last-mile logistics delivery are being filled slowly but steadily. Porter has a good model. The key to success will depend upon factors like availability, marketing, efficiency and technology, the important differentiators.